October surprise, at least for me. I’m at 61 silver coins, a lot more than the goal of 30 I started with. Finding old coins has become a real challenge. Places to hunt are slowly drying up. I’ve made a living at finding areas missed by others or where they just couldn’t see the coins with their detector. The number of these places are becoming few and far between. When I find a good place I pound it to death where I’m sure I’ve hit everything my detector can find. Now saying that, someone in the future will come along with a better detector or skills and find what I couldn’t with my detector. That’s just how it works. Unless, I improve my skills or equipment. So I’ve been kicking around upgrading my coil next year to give me an better edge than I have now. What coil???? I’m open to suggestions… I’ve been told and read the 13″ ultimate is the next logical upgrade for the Etrac. I’m not considering going to a smaller coil, I just don’t have the patience for hunting that way. At least yet. I’ve managed to find 5 additional silver coins since my last post. Two Mercs were just very difficult to find, deep and in iron trash. The three Rosie’s were just random finds in areas people occupied, but not in great numbers. I will end my post here, my etrac is calling me and I’m dieing to find number 62 or maybe my first “Big Fish” as Randy would say at mapsurfer. Good luck! I did hit 62 silvers by finding a 1943D Mercury dime in excellent shape. 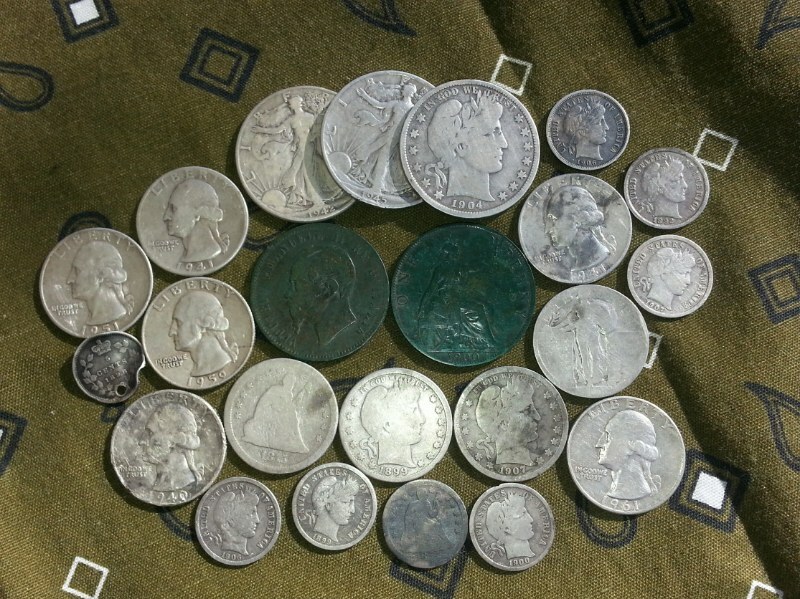 Ironically todays finds rounded up my find totals for dimes, quarters and pennies. This could be something for numerologist to ponder. Ex – my mercury dimes and Roosevelt dime finds are even at 24 each. A good day considering how long it took me to find 1 silver today.